RRP £27.99 Our Price £25.19! save 10%! Child-led learning in the early years allows children to thrive while making accelerated progress. Young children learn and develop best when they are in a stimulating environment which is carefully organised and equipped to meet their needs, interests and stages of development, and where each child’s progress is carefully observed, managed and enhanced by adults who engage and interact with them to support them in making outstanding progress. Demonstrating how a child-led approach supports the development of purposeful, calm, confident and independent children, The Nursery Year in Action offers a unique month-by-month overview of the workings of an outstanding Nursery setting. The book covers all aspects of practice from the organisation of the classroom and garden and the rationale behind this to the routines and boundaries that ensure children are safe, happy and therefore able to explore and learn. It tracks the events of each month in the year paying particular attention to the environment, the role of the adult, links with parents, children’s individual needs and the key areas of learning and development. 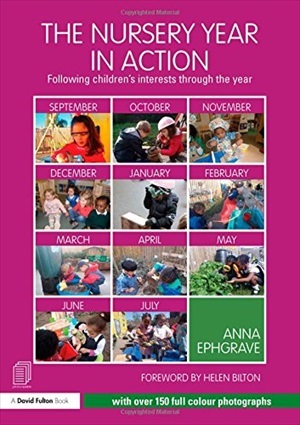 Throughout the book Anna Ephgrave gives the reason behind each decision and shows what the outcomes have been for the children, emphasising that a child-led approach, with planning in the moment can meet the requirements of the revised Early Years Foundation Stage and the individual needs of the children.